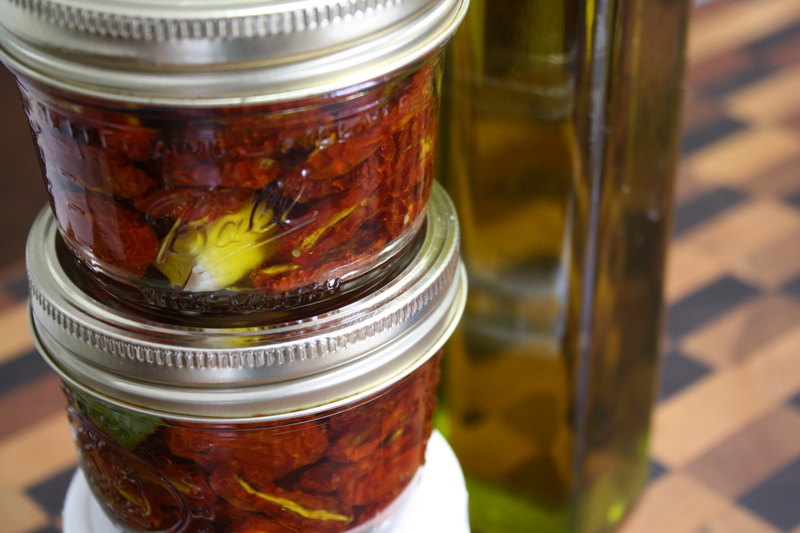 Making “sun”-dried tomatoes is easy. EASY!! If you like to garden at all you can save yourself a lot of money and make your own. Or head down to the farmer’s market and buy some grape or Roma tomatoes. 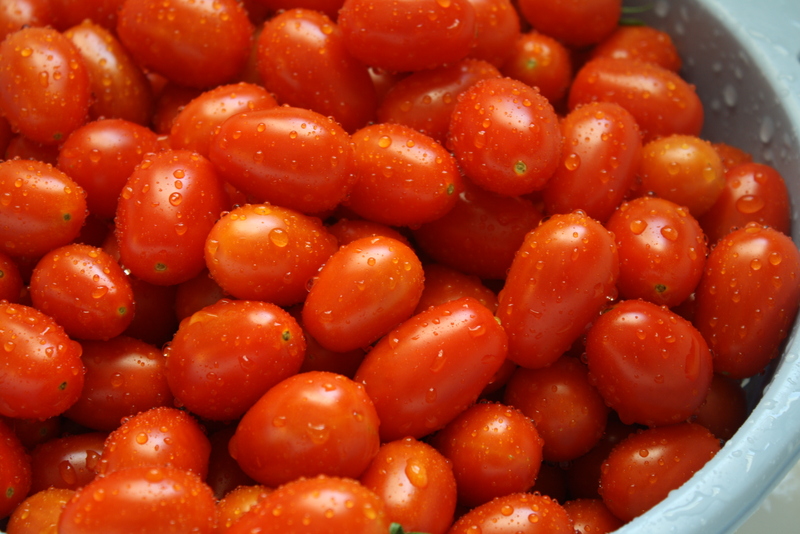 Grape tomatoes are a cross of cherry tomatoes with roma tomatoes. You get the cherry sweetness with the Roma meatiness all in one great versatile tom. I have used grape toms for this for many years. Grape tomatoes grow like weeds practically and don’t care if its a “good year” for tomatoes. They produce anyway. If your oven will heat to a low temperature (like 170F) you can do this without any fancy equipment. 2 Half sheet cake pans or similar sized cookie sheets. As many tomatoes as you want to work with. Set your oven to 170F. Sort and wash your grape tomatoes. You don’t want any blemished or damaged toms (use those for other things where you can trim off the yucky parts) Use your best toms for making the best “sun”-dried toms. 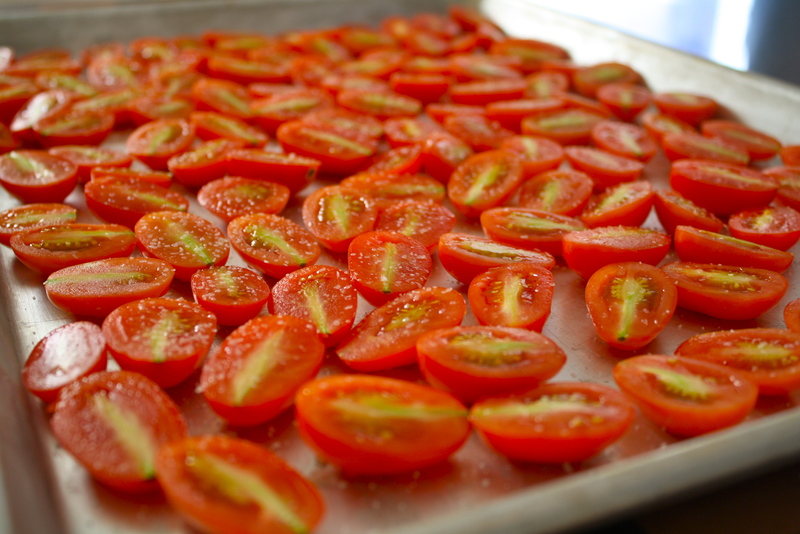 On a cutting board, slice your grape tomatoes in half lengthwise. Place cut side up on cake pans with only a small space between pieces. They are going to shrink down so its OK to crowd a little, just keep them to one layer. Continue until you have fill up both pans. Lightly sprinkle entire sheet with salt. Repeat on second pan. Place both sheets in oven and let them “dry” for about 8 hours. Its great if your oven lets you set it to bake for a certain time and then turn off because then you can do this overnight. This makes having the oven on (in summer) easier for your utility bill since its cooler at night. 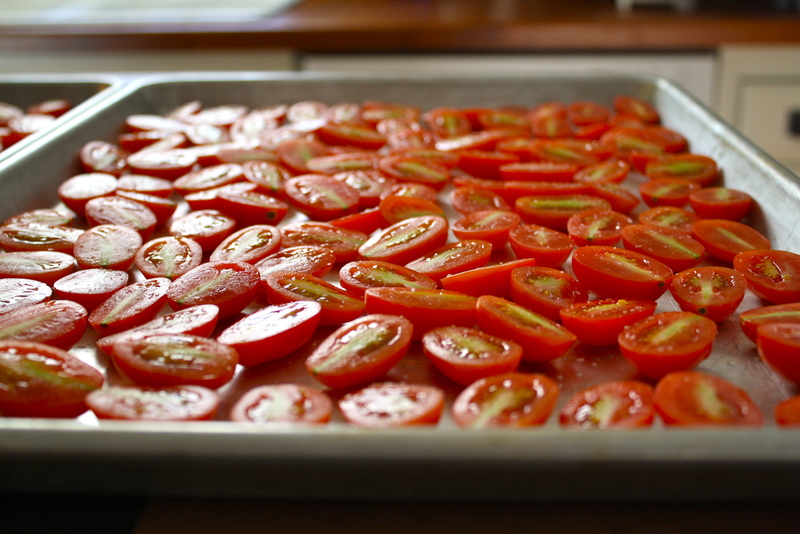 You want the tomatoes to dry to a “leather” stage. You want them to be like “plump” raisons. If they dry all the way to “hard”, you’ve gone too far. Remove the toms and let them cool. Dip each tom in white vinegar and shake off the excess. Place the toms in clean, sterilized canning jars. Don’t pack too tight, leave about a 1 inch head space. 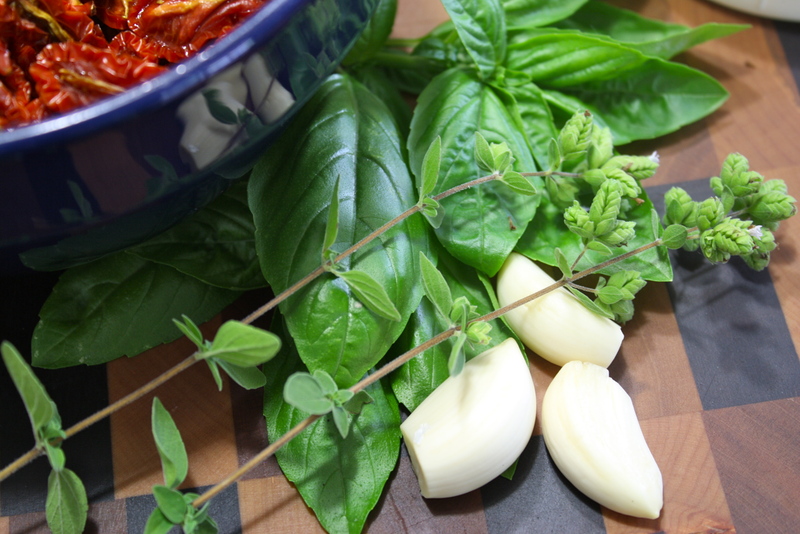 Add a clove of peeled garlic and a sprig of fresh herb if you like (basil, oregano, thyme). Pour the olive oil over contents to about 1/2 inch below the top. Cap jars, label and set aside for about 2 hours. After that you can put them in the back of your refrigerator and forget about them for at least a couple of months. 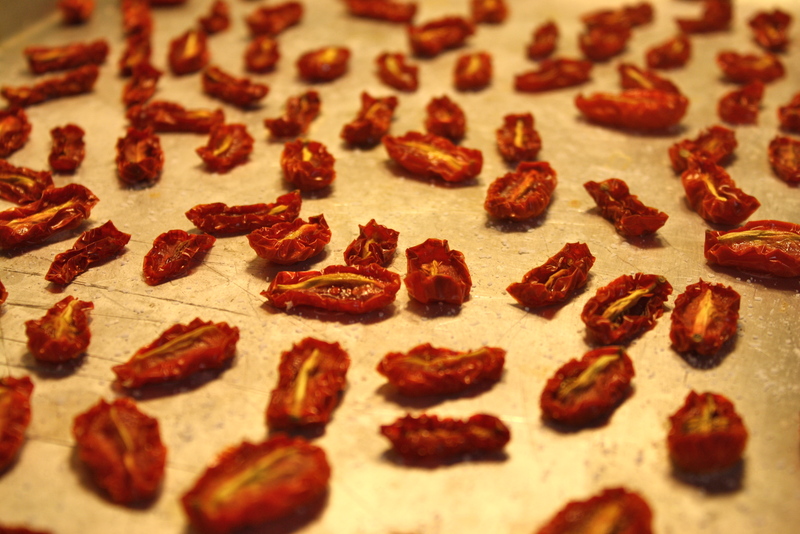 In two months or so you can start using them for whatever you like “sun” dried toms for. I’m not one who cares to have to slice mine, so I often take the entire jar contents and puree it in my food processor to make a tom “jam”. I can then add a spoonful to whatever I want to have that burst of summer flavor. The jars I have made keep well in my frig for at least a year. I have found that mine actually taste a lot better than the store bought and save me a fair amount of money. So if your tired of shelling out for this delicious tidbit…..give this a try. You will not be sorry! Enjoy! 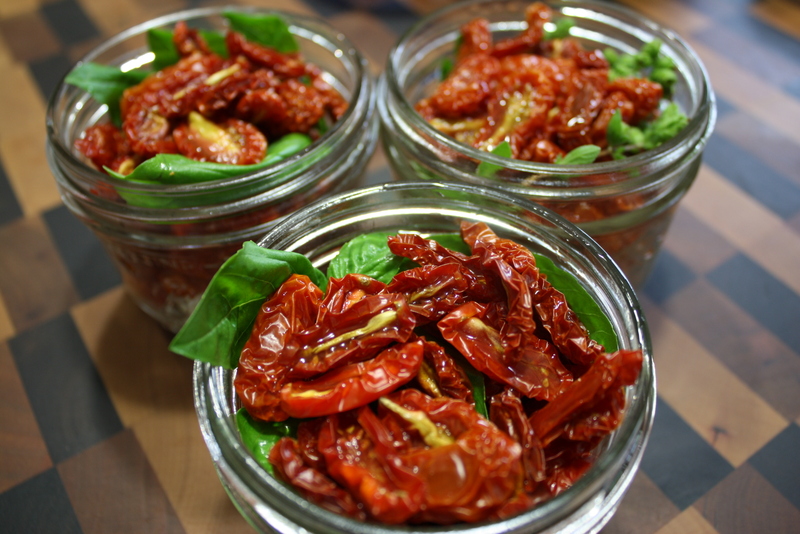 wow, your homemade “sun” dried tomatoes look absolutely stunning, I will save this post, it’s so easy !! It has become a summer ritual in my home for many years. My husband even helps! 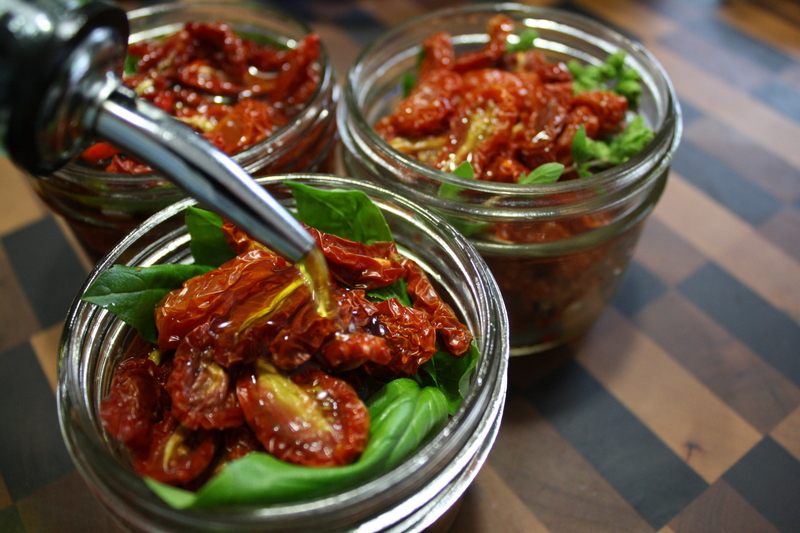 I’ve dried my own tomatoes before, but never thought about doing the jar thing and using herbs too. Thanks! It adds another layer of flavor..and who doesn’t like more flavor!